In most years a concentration of spawning and rearing Delta Smelt is found in the Cache Slough Complex of the north Delta. The Cache Slough Complex consists of Cache Slough, Liberty Island and adjacent sloughs, and the Sacramento Deepwater Ship Channel. Upstream-migrating adult smelt ride the flood tide in winter seeking freshwater spawning habitat with warmer, more productive, stable conditions to spawn and rear their young. The Cache Slough Complex is such a place. 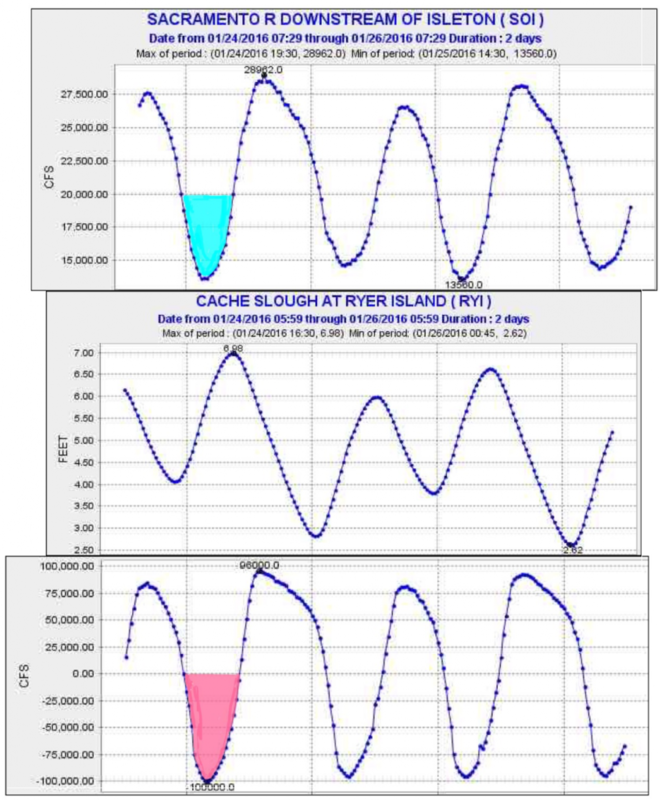 Recent flood tide conditions at the junction of the Cache Slough help show how the smelt migration is accomplished (Figures 1 and 2). Flood tides carry the smelt upstream in the main Sacramento channel past Rio Vista to the mouth of Cache Slough, where the tide and fish turn left up the slough on toward the lower Yolo Bypass. The Bypass is a large area with a large tidal exchange and minimal freshwater inflow and outflow most years. In contrast, Steamboat and Miners sloughs and the lower Sacramento River channel above Cache Slough have strong freshwater flows and limited areas of tidal exchange, resulting in no upstream-directed flood tide flow. Their downstream-directed flood tide flows enter the Cache Slough flood tide, turning right and going upstream. 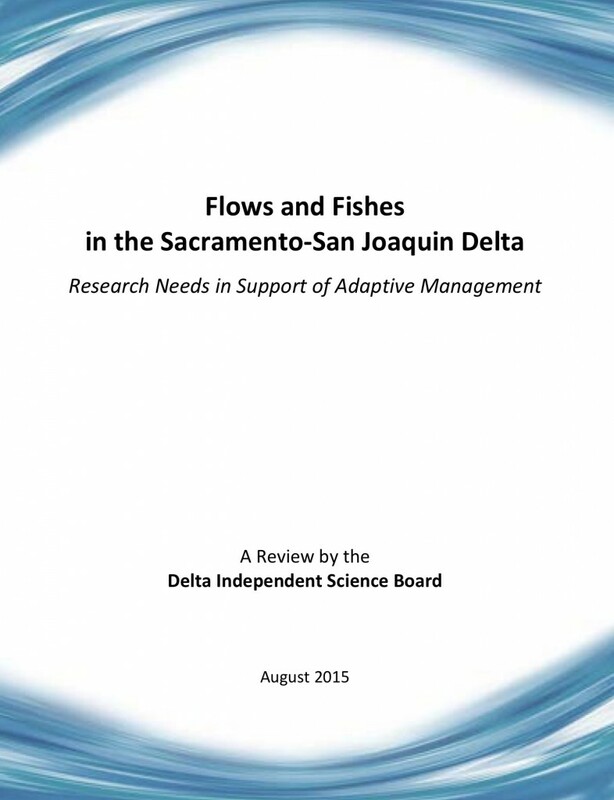 These circumstances likely enhance smelt migration toward the Cache Complex and hinder migration up the Sacramento and its two branches that carry the main river inflow to the Delta. Figure 1. 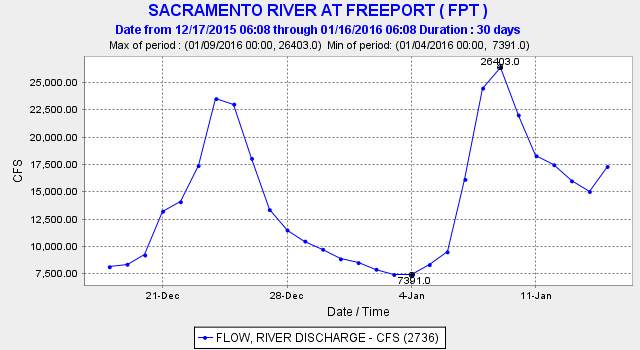 Floodtide flows (cfs) on 1/24/16 in the lower Sacramento River near Rio Vista upstream to Cache Slough Complex. Red arrows are upstream flow rates. 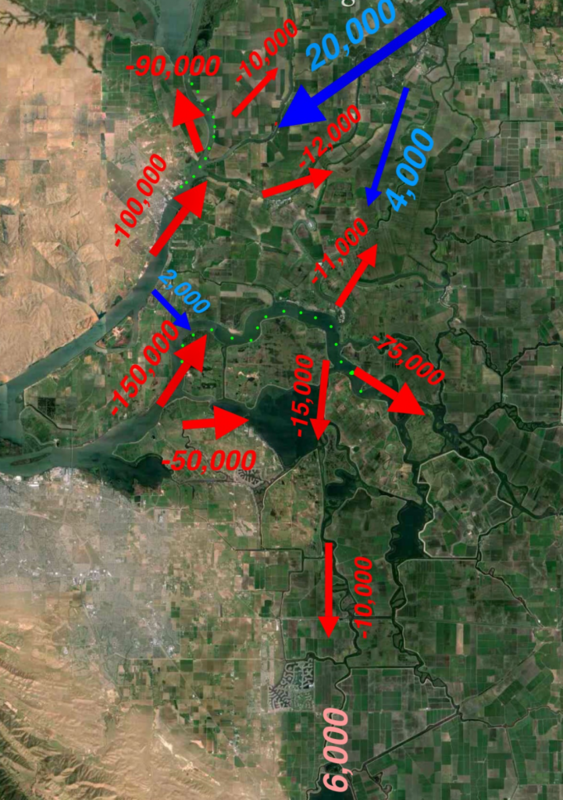 Blue arrows are downstream flows during the flood tide in Miner (top) and Steamboat (middle) sloughs, and Sacramento River (bottom). Light blue dots are CDEC gaging stations. Figure 2. upstream of Cache Slough 1/24-1/26 2016. Blue denotes net positive downstream flows in Sacramento River continue on flood tides. Red denotes upstream directed currents in Cache Slough during flood tides. Gage locations for SOI and RYI are in Figure 1. The Cache Slough Complex including the lower Yolo Bypass and Deep Water Ship Channel is a great place for smelt, salmon, and other native fishes in winter and spring especially in wet years like this. With freshwater inputs modest from Putah Creek, Cache Creek, and the Colusa Basin Drain, and a vast acreage of marshes, sloughs, and shallow bays with long water residence times and tidal sloshing, the whole place becomes “green soup” perfect for growing young smelt. With lots of municipal, urban, and ag runoff and drains, the area is nutrient rich, warmer, and more productive, growing plentiful plankton for smelt food, unlike the river and Delta in winter-spring. In very wet years, all of that wonderful green soup is blown into the Delta and eastern Bay by floods pouring through the Bypass and out the mouth of Cache Slough. In wet and normal years much of the productivity and smelt reaches or extends into the Delta (e.g., 2011, the last good year for smelt). The Delta and Bay significantly benefit from these inputs. But in the dry and critical years, especially multiyear droughts, things are not so good for the Cache Slough Complex. In winter, the tides still carry the adult smelt and juvenile salmon up into the Yolo Bypass, but with virtually no freshwater inflows. However, with continuing ag and municipal (e.g., North Bay Aqueduct) demands and most of the discharges, the place becomes a hot stew by late spring. 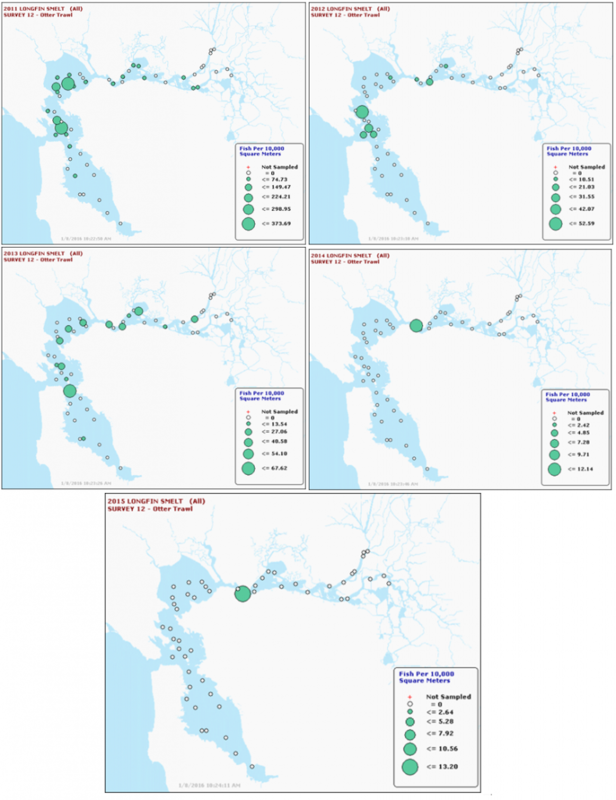 Negative daily average net flows from all the local demands on water virtually trap young smelt in the Complex, as they are unable to ride natural net downstream flows to their spring-summer nursery in the west Delta and eastern Suisun Bay. With summer water temperature approaching 75-80°F, most of the smelt die from the heat or predation by abundant warm-water predatory fish. Get the North Bay Aqueduct intake out of the Complex with a pipe to the Sacramento River. Divert more Sacramento River water into the upper Yolo Bypass at the Fremont Weir to add to minimum flows in the 40 miles of the Bypass. Fix the stuck-closed gate at the head of the Deepwater Ship Channel on the Sacramento River to allow more freshwater inflow into the Complex. Stop the use of tide gates for irrigating lands within and adjacent to the Complex. Improve the water quality of all discharges into the Bypass. The key to fixing all the Bay-Delta ecosystem’s problems including saving salmon and smelt from extinction lies in managing hydrology and water use in dry years and multiyear droughts. The solutions, especially the five mentioned above, are really not that hard to implement. It corroborated past studies in finding that production of young is related to freshwater inflow to the estuary. The production of young determines the subsequent abundance of age two adults. The production of young is also related to the previous number of adult age-2 spawners. The survival from age 1 to age 2 (young recruits to adult spawners) is related to Bay and Ocean conditions, and may be declining in recent decades. The facts remain that the population of Longfin Smelt in the San Francisco Bay-Delta estuary has crashed. The numbers recorded in recent index years is especially low (see footnote #1). Bay-Delta trawl survey results for this recent December just published compared to past survey years (Figures 1 and 2) support my earlier conclusion – “they are gone”. The slow population death spiral from low young production, to poor spawner production, to poor young production, has reached its course, as also suggested by Hobbs and Moyle3. Figure 1. December catch of Longfin Smelt in Bay Otter Trawl Survey, 2011-20154. Figure 2. December catch of Longfin Smelt in Bay Midwater Trawl Survey, 2011-2015. The beginning of this water year (early winter 2015-2016) may mark the last viable spawning migration of Delta Smelt in the San Francisco Bay-Delta Estuary. Remnants of the Winter Run salmon population below Shasta are also passing downstream through the Delta to the Bay and Pacific Ocean. Two moderate storm periods in the Central Valley so far this winter have driven Bay-Delta hydrology, Low Salinity Zone dynamics, salmon emigration, and the remnant Delta and Longfin smelt spawning runs. Moderate exports (4000-6000 cfs) from the South Delta pumps have also had to their effects, as has the annual winter closure of the Delta Cross Channel. Together these “forces” provide a picture of a key dynamic period of the Bay-Delta Estuary ecosystem as well as to how to better manage the system for the benefit of everyone including the endangered smelt and salmon. The winter started with drought conditions exemplified by low freshwater inflow and outflow in the Delta, and the Low Salinity Zone sitting far upstream in the Delta. Exports from the South Delta were minimal. Then came two major storm periods of moderate freshwater inflow that changed everything. The first peaked around Christmas and the second on January 9th (Figure 1). With the Delta Cross Channel closed, most of the storm water passes down the Sacramento River channel to the eastern Bay (Figure 2). Figure 1. Sacramento River flow entering Delta in early winter of water-year 2016. Figure 2. 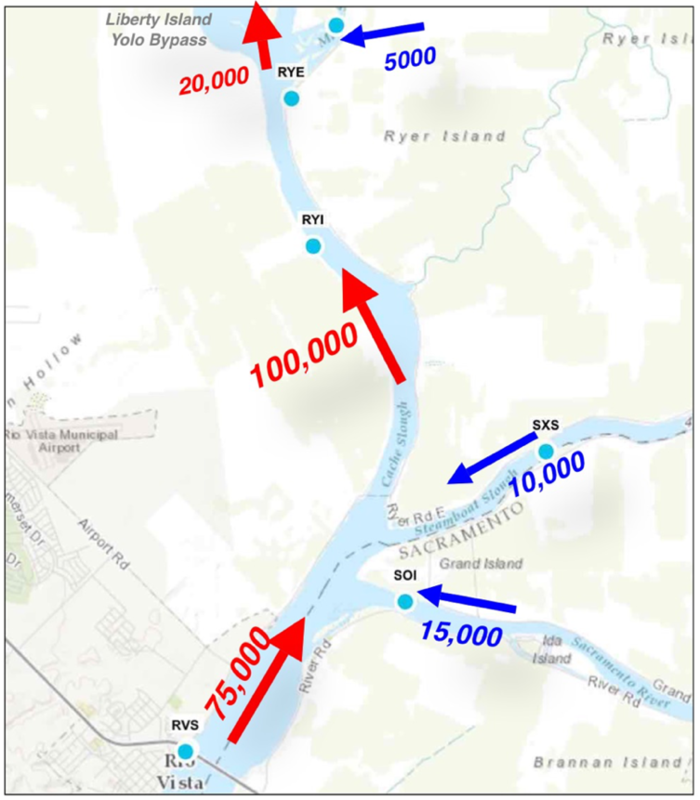 Sacramento River inflow entering Delta during early winter storms is split between Sacramento River channel (20,000 cfs) and Georgiana Slough (5000 cfs). The Central Delta also receives approximately 2,000 cfs net freshwater inflow from Three Mile Slough. San Joaquin River inflow from southeast (not shown) is less than 1000 cfs. South Delta exports reached approximately 6,000 cfs during storms (red arrow). 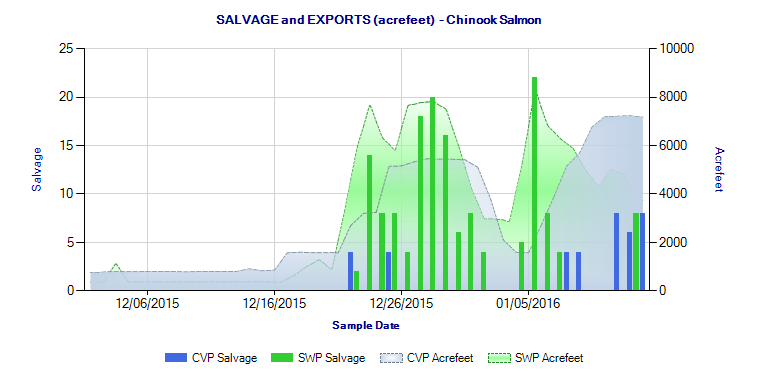 Salvage of Winter Run sized salmon smolts1 has increased with the storms and higher exports from the two South Delta pumping plants (SWP and CVP) (Figure 3). These salvaged Sacramento River salmon likely enter the Central Delta via Georgiana Slough and then follow net negative flows to the south Delta export pumps (red arrow in Figure 2). These negative flows are monitored as Old-Middle-River or OMR flows (Figure 4). Figure 3. Salvage of salmon smolts at South Delta SWP and CVP pumping plants in early winter of water-year 2016. Figure 4. Net Old and Middle River (OMR) flows in Central Delta in early winter of water-year 2016. Adult Delta and Longfin Smelt enter the Delta from the Bay on their spawning migration during the first winter storm, attracted by the warmer, more turbid, higher storm flows. Being poor swimmers, they ride the flood tides into the Delta, staying nearshore on ebbs and moving out into the upstream currents on flood tides2. 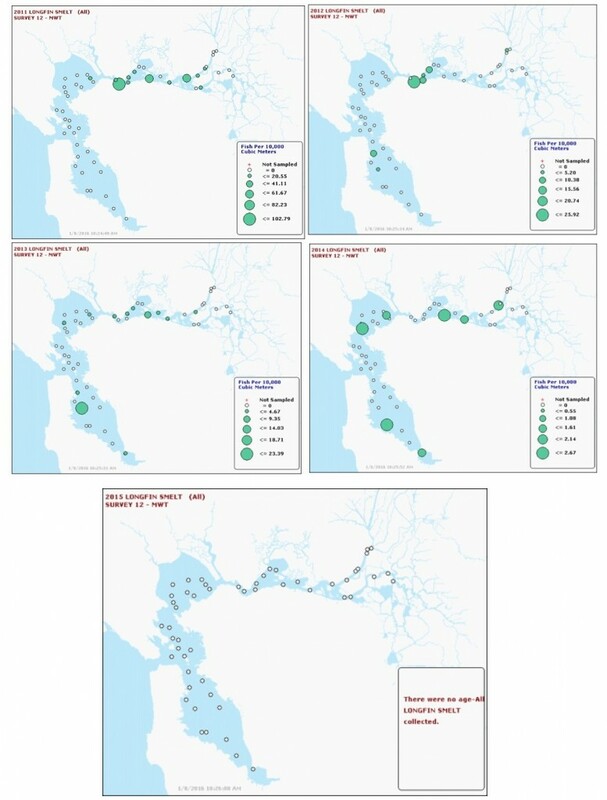 Because much of the upstream flood tide current is into the Central Delta (with high freshwater inflow in the Sacramento River channel – Figure 5), many smelt enter the San Joaquin channel, becoming “trapped” in the Central Delta and susceptible to moving with accentuated flood tides3 to the South Delta export pumps. Figure 5. Magnitude of flood tides (red) during recent early winter storms. Note minimal flood tides in Sacramento River channel carrying most of storm flow (blue). South Delta flood tides are roughly doubled due to the effect of the near 6,000 cfs export. Note also the strong flood tides into Cache Slough and lower San Joaquin areas (green dots), important spawning areas of Delta Smelt. Recently the Smelt Working Group recommended reducing South Delta exports and limiting OMR to being no more negative than -2000 cfs5 to protect Delta Smelt. In its Determination Under Component 1 of the 2008 OCAP Biological Opinion based on the Working Group’s recommendation, the US Fish and Wildlife Service6 set the limit at -3500 cfs from the existing -5000 cfs limit. 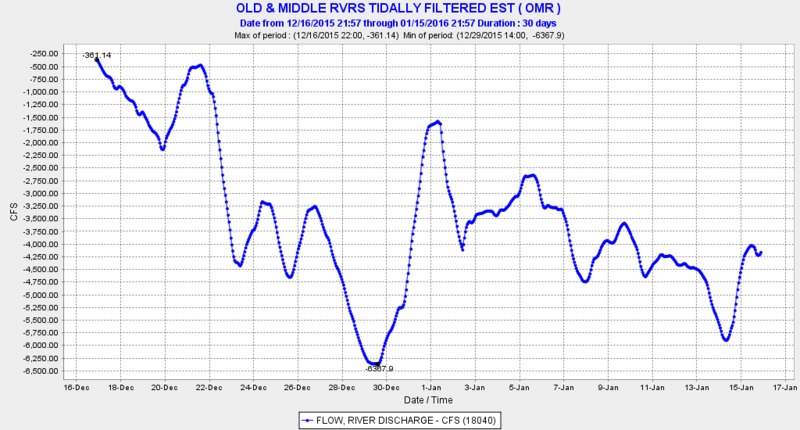 “This will ensure more positive OMR values during the peak of flow and turbidity from this week’s storm. The Service believes that in light of the risk to Delta Smelt, the OMR flow proposal from Reclamation and DWR is prudent.” The Service had no real justification for revising the Working Group’s recommendation. The Working Group had no recommendation based on Longfin Smelt, despite detection of larvae in the first larval survey of the year. Larvae were detected in low numbers in the San Joaquin channel of the Central Delta7 . Such detection is remarkable given few adult Longfin were collected in the December trawl surveys. (Note: Criteria for action remain expressed as density in surveys and salvage numbers, which should not continue as criteria at the present extreme low population level.) “Exports targeting -5,000 cfs OMR will slightly increase risk of entrainment through the week as inflow declines until predicted rainfall on Wednesday causes Delta inflow to rise again about Saturday. A USFWS implemented recommendation from the SWG of -2,000 cfs OMR would be highly protective of Longfin Smelt adults and larvae.” Note again that this recommendation was not adopted. No determination as to the NMFS 2009 OCAP Biological Opinion for salmon has been made. The Working Group was seeking to minimize the accentuated flood tides and exports to limit pulling the higher turbidity water and smelt into the south Delta near the export pumps. With smelt and salmon already present in the central Delta because of the lack of previous precautions, the Working Group recognized the higher risk from exports. Their recommendation was more protective than the Service’s subsequent determination. Export only from CVP Tracy (Jones) pumping plant, which has less risk to smelt and less effect on flood tides than SWP exports from Clifton Court Forebay. Lower exports between storms to reduce export/inflow ratio and net flow from west Delta. Open the Delta Cross Channel to increase net downstream flow and lower the magnitude of the flood tides in the San Joaquin channel and increase the flood tide magnitude in the Sacramento River channel. Put in the False River Barrier to limit smelt movement into the Central Delta via this route and lessen the magnitude of the flood tides in San Joaquin River channel and Central and South Delta. In recent posts I described the need for spill – releases from reservoir storage to increase the number of young salmon reaching the ocean.1 Last summer and fall, Sacramento River salmon were forced to spawn nearer Shasta Reservoir because of limited cold water releases to save reservoir storage in the ongoing drought. Instead of the normal 50 miles of cool water, the salmon only had 10 miles. This winter, the young salmon that spawned in the Sacramento River near Shasta and survived now have to contend with minimum Shasta releases, since most of the reservoir inflows are being stored for future water supply. 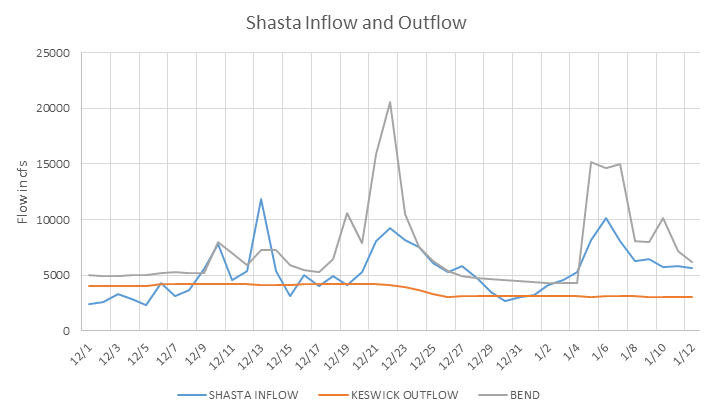 The winter flow pulses that stimulate emigration and carry the young salmon 300 miles to the lower river, Delta, Bay, and ocean are missing from the spawning reach below Shasta (see Keswick Outflow in chart below). In contrast, millions of Battle Creek hatchery salmon released 30 miles below in the Sacramento River have the advantage of local inflows from un-dammed tributaries (Bend flows in the chart) to carry them to the ocean. (Note: hatchery fish releases are often timed to flow pulses.2) From the chart below you can see that these inflows have actually been higher than releases from Shasta Reservoir. In the previous posts I had suggested spills (releases) of 5-10 % of reservoir inflows to increase salmon survival in the current drought. So far this winter, a reasonable prescription would have been several days of 500 cfs spill each time reservoir inflow approached or exceeded 10,000 cfs. A 500 cfs spill would represent a 12-15% increase in streamflow to stimulate emigration of young salmon downstream into the higher flow reach of the river. This would certainly qualify as an adaptive management experiment to help improve survival of endangered salmon in the Sacramento River. Inflow and outflow from Shasta Reservoir in December 2015 and early January 2016. The Bend Bridge gage is on the Sacramento River near Red Bluff, CA, approximately 30 miles below the Keswick Dam gage. Sacramento River flow at Bend Bridge includes the inflow from Cow, Clear, Cottonwood, and Battle creeks.